Its Christmas almost yet I am here thinking of whether I should choose a higher rental income vs capital growth as a strategy for 2012. When you are in business, there is just no holiday season in your diary. 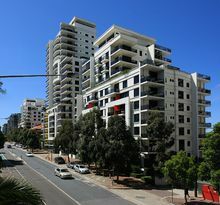 My strategy was to buy apartments in the apartment blocks where I own individual units. That way I can someday own the whole block of apartments. Sounds like a long shot, doesn't it? Anything is possible. The apartments are close to the city center. The capital growth is not great but the return on investment is amazing when you rent the places out. The demand is great. I haven't had a vacancy since 2002 in one small apartment. All in all its a "buy-to-let" dream location. I own 3 apartments in the area to show for my confidence. Well, after a long inner planning session, I decided to go buy a few units in the suburbs to balance my real estate portfolio. In the suburbs the returns are lower but capital growth is great. I do have a feeling that I will want to sell some of my properties in a few years. My decision should be based on what I will do with the property. If I buy for speculation reasons, which happens to be a possibility, i would rather buy in the suburbs. If I buy for long term rental, I should go to the city. The problem is that I don't have an idea what I will do with the properties I want to buy in a few years time. Whilst in the dilemma, a nice lady who lives in her apartment close to one of my apartments send me an email. I have decided to sell my apartment at a 20% discount. The agent fees will be extra if sold by an estate agent. I am putting my apartment on the market the first week of January. I was interested in buying this apartment even when it was 100% cost. At 80%, I am super interested but I havent decided whether I want a rental income boost or a quicker net worth growth in a few years. The properties closer to the city are relatively old and not so safe. The demand for rental units is high, but who knows what may happen in a few years. Suburbs offer stability and peace. All owners are usually investors who take great care of their investments. Which is which? Lord please help me take a decision.